The main problem with modeling schizophrenia has been a lack of knowledge about its etiology and basic neurobiology. This problem has precluded modeling aspects other than a rather limited number of phenomena. 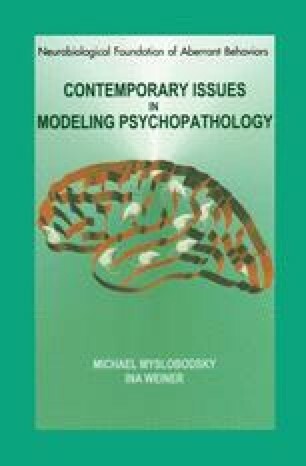 Most traditional models of schizophrenia reproduce primarily phenomena linked to dopamine, because the dopaminergic system has been strongly, although indirectly, implicated in this disorder (all effective antipsychotic drugs are antagonists of dopamine receptors, and dopamine agonists induce symptoms that resemble psychosis) (Kornetsky and Markowitz, 1978; McKinney and Moran, 1981; Ellenbroek and Cools, 1990; Costall and Naylor, 1995). Some dopamine-based models involve behavioral paradigms that were inspired by antipsychotic (i.e., antidopaminergic) pharmacology but bear no resemblance to schizophrenia (e.g., antagonism of apomorphine-induced emesis). Others reproduce phenomena analogous to selected features of schizophrenia such as motor behaviors (e.g., dopamimetic-induced stereotypies) and information processing deficits (e.g. apomorphine-induced prepulse inhibition of startle (PPI) abnormalities) (for review see, Costall and Naylor, 1995). These dopamine-linked behaviors, although not specific or unique for schizophrenia, can be at least detected and precisely evaluated in non-human species and were useful in screening drugs with a predicted mechanism of action (e.g., dopamine blockade). Their predictive validity might be expected given that the models were based on changing dopamine function.